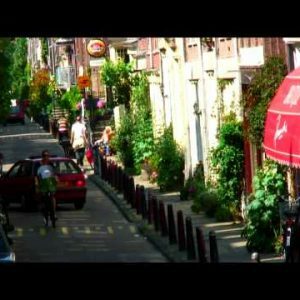 Shot of houseboats and a street in Amsterdam - Stock Footage, Inc. Tags: Amsterdam, ancient, architecture, bicycle, biker, boat, bridge, building, buildings, canal, car, city, cityscape, day, daylight, destinations, dutch, europe, european, exterior, facade, facades, floating, holland, home, home fronts, house, houseboat, houses, housing, Man, netherlands, old, outdoor, outdoors, outside, People, relaxing, river, street, structure, traditional, transport, transportation, travel, urban, vessel, vintage, water, woman. Shot of houseboats and a street in Amsterdam. This was taken from a boat on the river. Two people paddling a canoe near a tree in Amsterdam. 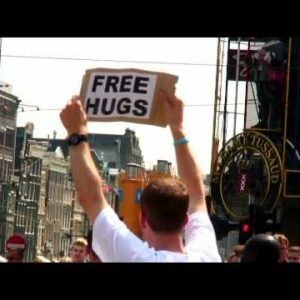 Free Hugs sign in Dam Square Amsterdam.